Introverted Birdie is sent to live in a quaint and isolated convent by her concerned grandmother, in an attempt to change her sobering outlook on life. But left to her own devices she develops a heightened obsession with blood, which seems all too willing to flow from her body, and reoccurring visions and hallucinations that pull her in every direction. Sometimes whimsical and sometimes gory, Birdie passively questions - is she a saint or is she cursed? On Google Play, Amazon, DISH and iTunes October 2nd (USA). Escaping the watchful eye of Mother Superior and the other nuns Birdie begins an intimate friendship with Julia, the groundskeepers daughter, but things begin to spiral out of control when the closing of the convent is announced and fates must be confronted. 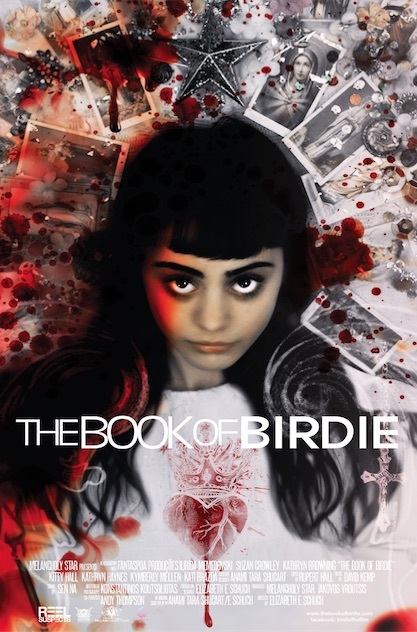 THE BOOK OF BIRDIE is the feature directorial debut from Elizabeth E. Schuch, who's background includes credits and accolades in theatrical design, visual effects, and storyboarding. The film has a majority female crew and exclusively female cast led by mesmerizing newcomer Ilirida Memedovski in the starring role of Birdie alongside seasoned talent Susan Crowley (Mother Superior) and Kathryn Browning (Grandmother).